One must look at the light at work. It is light that creates. I sit before a sheet of sensitive paper and I think. For good reason, one’s first impulse may be to try to grasp the photographic creations in this volume from a media standpoint. After all, it does concern photographs, results of that memorable method which, at the time of its invention, had already attested to the fact that light itself had become the artist. In a literal sense, photo-graphy is also nothing other than, what was once called, light-writing—an art in which light created its own metaphor. It is not surprising that, quite early on, a mythology was attributed to this new species of pictures. Herein the sun proved to be a guarantor of natural authenticity, similar to selfexpression, that understood how to capture itself in its fixed rays of light. “Photography’s light-writing was therefore, a form of natural speech, one that guaranteed the visual acuity of the image,” writes Bernd Stiegler. One could, therefore, believe it. Of significance, still today, is that this manifested characterization has never completely disappeared. As a god-of-light bearing witness to itself—one that leaves behind a magical trace, proof of its creative force—today’s photographs no longer want to be looked at. Nevertheless, we remain dependent on them when it comes down to reading the infinite aspects of the universe in order to literally see them as ‘true.’ To recognize and be recognized by the world, photographic pictures remain tried and tested. Once it was drafted on paper, Stella Polaris* Ulloriarsuaq generated an ambitious venture—one that was understood to be a multilayered test of our photographic skills. On the one hand, in their colorful aesthetic form, the light-photos are immediately recognized as artifacts. On the other, they completely refer to their motif. Presumably coming from the periphery of the Greenlandic coastal region, the photographic works of nomi baumgartl and sven nieder bear witness to those icy scenes from nature that have long overlapped our collective mental imagery.What is meant is traditional phantasies that have been equally imprinted by factors of an inhospitable habitat and the eternal ice. What would it be like to have to live there? Or simply to be there? And wasn’t it always like that there? The uneasiness that affects us vis-à-vis the outdated clichés in our heads may be owed to knowledge because, in light of our day’s dramatic changes in climate, the question arises as to whether pictures like this are at all right and good. 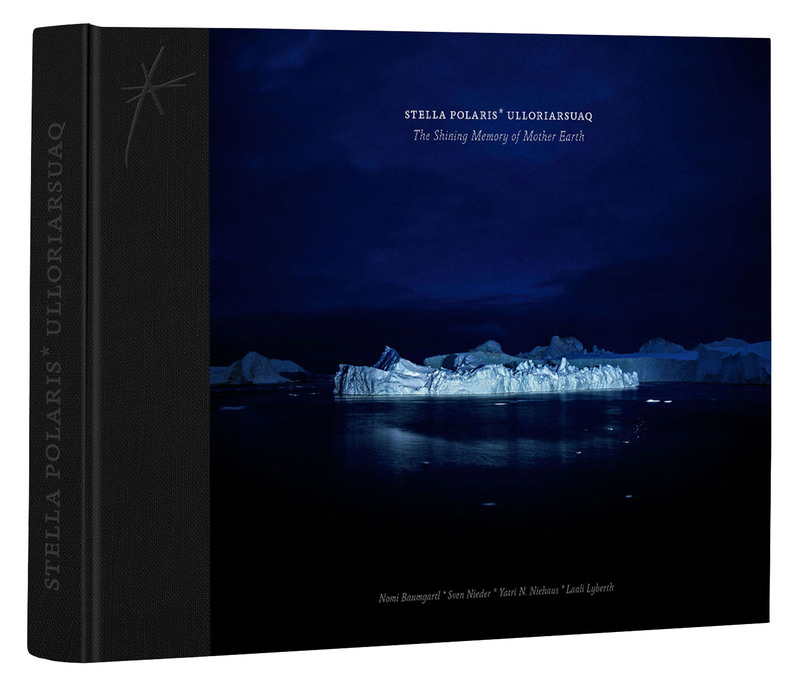 The photographic ice landscapes in this volume emphatically affirm the climate change in a highly aesthetic way. The photographs almost insist on their beauty “despite everything” without doing so under false pretenses. These photographs don’t want to be looked upon as mere witnesses of a threatened, or even dying landscape. The light comes to their aid. The story is easily told. Under the icy region’s mass of stars, Baumgartl and Nieder invited a group of local Greenlanders to be the light-givers themselves. Much of it was characterized by spontaneous gestures and moments, both by accident and with a relished loss of self-control. It is even more remarkable how the light, merely thrown by hand held colored flashlights, made it possible to see the enormous ice-landscape. As a whole they reveal an aesthetic, for which the term “Light-painting” is insufficient. In fact, it is rather a process of inscription, which is not to be under- stood in terms of taking ownership but as an authentic performing act of approaching the world. man ray once challenged us to look at the light at work. This book of photographic art work exemplifies that, when doing so, it may tread its very own paths. Waterless printing on finest Fedrigoni Tatami and Arcoprint Milk paper.